Seventh Street Books, 9781633880887, 191pp. 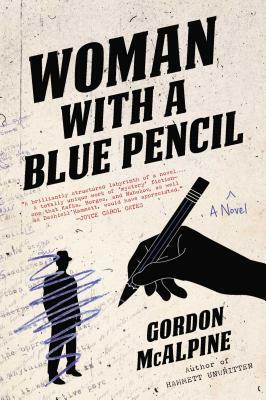 “Woman with a Blue Pencil is a brilliantly structured labyrinth of a novel—something of an enigma wrapped in a mystery, postmodernist in its experimental bravado and yet satisfyingly well-grounded in the Los Angeles of its World War II era. Gordon McAlpine has imagined a totally unique work of ‘mystery’ fiction—one that Kafka, Borges, and Nabokov, as well as Dashiell Hammett, would have appreciated.” —JOYCE CAROL OATES What becomes of a character cut from a writer’s working manuscript? On the eve of Pearl Harbor, Sam Sumida, a Japanese-American academic, has been thrust into the role of amateur P.I., investigating his wife’s murder, which has been largely ignored by the LAPD. Grief stricken by her loss, disoriented by his ill-prepared change of occupation, the worst is yet to come, Sam discovers that, inexplicably, he has become not only unrecognizable to his former acquaintances but that all signs of his existence (including even the murder he’s investigating) have been erased. Unaware that he is a discarded, fictional creation, he resumes his investigation in a world now characterized not only by his own sense of isolation but by wartime fear. Meantime, Sam’s story is interspersed with chapters from a pulp spy novel that features an L.A.-based Korean P.I. with jingoistic and anti-Japanese, post December 7th attitudes – the revised, politically and commercially viable character for whom Sumida has been excised. Behind it all is the ambitious, 20-year-old Nisei author who has made the changes, despite the relocation of himself and his family to a Japanese internment camp. And, looming above, is his book editor in New York, who serves as both muse and manipulator to the young author—the woman with the blue pencil, a new kind of femme fatale. Gordon McAlpine is the author of Hammett Unwritten and numerous other novels, as well as a middle-grade trilogy, The Misadventures of Edgar and Allan Poe. Additionally, he is coauthor of the nonfiction book The Way of Baseball, Finding Stillness at 95 MPH. He has taught creative writing and literature at U.C. Irvine, U.C.L.A., and Chapman University. He lives with his wife Julie in Southern California.